(CNN) -- Iran will move to further enrich its uranium for a research reactor if it cannot obtain the fuel from overseas, semi-official state media reported Saturday. 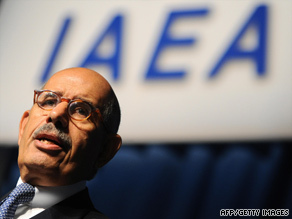 IAEA chief Mohammed ElBaradei said Iran's low-enriched uranium would be sent abroad and enriched. If talks with world powers and the United Nations nuclear watchdog fail, Iran will notify the latter that it will supply fuel for the Tehran reactor, said Ali Shirzadian, a spokesman for the Atomic Energy Organization of Iran. "The reactor is the major producer of radio medicines in Iran and its current fuel meets its needs for one-and-a-half year," he told the semi-official Iranian Students News Agency. It needs about 150 to 300 kilograms of 20 percent-pure uranium, Shirzadian said. Representatives from Iran will meet with ones from the United States, Russia and France on October 19 at the U.N.'s International Atomic Energy Agency headquarters in Vienna, Austria, to discuss an agreement for enriched uranium. A deal is important because it could reduce the amount of nuclear fuel Iran has to make a bomb. Under an agreement, Iranian low-enriched uranium -- not weapons-grade material -- would be sent abroad and enriched further before being sent back for use in Iranian medical research, said Mohamed ElBaradei, the head of the International Atomic Energy Agency. Iran recently sent shock waves through the international community by revealing the existence of a nuclear enrichment facility near the city of Qom. The Islamic republic says its nuclear program is for peaceful purposes, but the United States, among others, fears the country aims to build nuclear weapons. During a news conference Sunday in London, U.S. Secretary of State Hillary Clinton reaffirmed the Obama administration's stance on Iran. "It has a long way to go before any of us are convinced that Iran is willing to abide by its international obligations and to cease and desist any efforts toward its nuclear programs," Clinton said. It is important for Iran to know that the world is watching, she said. "The international community will not wait indefinitely for evidence that Iran is prepared to live up to its international obligations," said Clinton, who is on a diplomatic trip in Europe.